The Painter, Not The Gun! Remington Park was the creation of Edward DeBartolo, the shopping center developer who owned a few other tracks. Built from the ground up DeBartolo spared no expense, as the facility cost almost one hundred million dollars to build. Remington Park also received much attention for installing the first synthetic track in the United States. That experiment only lasted a few years as it was replaced with a natural dirt surface. The track also had an inner turf course, something unheard of in the land of quarter horses. Most people would probably think that the naming of Remington Park had something to do with the rifle, but it didn't, it was named for the American Painter and Sculptor, Frederick Remington (1861-1909) who's art focused on the old west. Remington Park gained national attention in 1989, when the inaugural running of the $150,000 Remington Park Derby was won by a horse named Clever Trevor. A few months later Clever Trevor showed up at the Kentucky Derby with what many felt, had a chance to win. He finished thirteenth, but the experience made the Remington Park Derby a stepping stone to the Kentucky Derby. 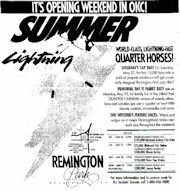 In 2001 the Remington Park Derby, became the Oklahoma Derby. Those glory days were short lived, soon after Remington Park opened major league racing came to Texas, creating competition for horses and dollars. From those promising first few years, Remington Park settled in to the what seems to be the normal progression of racetracks today. In 1995, Remington Park received it's first booster shot when Off Track Betting was introduced. This was followed by an ownership in 1999, when the Magna Group (MEC) which was gobbling up everything in site took over the reigns. Lights were added in 2001, and the era of night racing began, hoping to make Remington Park more attractive to the younger crowd. In 2005 the track got the bomb, casino gaming, what every track manager wants for Christmas. In 2010 new owners, Global Gaming RP took over ownership of the track at auction, as the Magna Empire continued to collapse. In 2013 I finally made it to Remington Park, it was the last weekend of the thoroughbred season. As you drove on the interstate, there was the unmistakable glow of night racing on the horizon. Pulling into the track the parking lot was pretty full, the track itself look in great shape. As you walk toward the track it starts to look a bit more familiar, Casino entrance and Track entrance. The track entrance looks like the original clubhouse, you walk in to what sounds like an exercise class behind heavy curtains, this turns out to be some kind of private affair, nothing to do with racing. Then comes the hunt for a program, after a few inquires I find the place they are sold. At least there are plenty of wagering machines and even a few tellers. Out on the apron your greeted with a well manicured track, a jumbotron sits in the infield big as life. Off to the left is a waterfall with a magnificent bronze statue, maybe a Remington maybe not. The place still seems major league, but something doesn't seem quite right. You look around then turn around and look at the well maintained second level grandstand area, then it hits you, nobody is here, your all alone. The horses are loading and no one is outside watching, the grandstand seats are empty. They all must be inside busy with simulcasting!